A mix of clouds and sun. High 72F. Winds SSW at 10 to 20 mph..
Japanese chefs take great care in the preparationof authentic ramen. A recent trip tro Japan proves eye-opening to the appreciation of the complexity—and simplicity—of ramen. This was not the familiar stuff of cellophane packages that sells in supermarkets at $1 per dozen. Rather, it was the rich, steaming broth, topped with fresh wheat noodles, sliced meat and chopped vegetables that made diners slurp and sigh before slurping and sighing again. It was a meal in a bowl, satisfying and filling at any hour—and every hour—but especially at 9 a.m. on a damp winter morning in Tokyo when the chill had us in its grips. We had spotted a vendor on an earlier visit when we had passed quickly—longingly—to watch seafood prepped for sale. “We’ll be back,” we promised ourselves, and so we were in the waning hours of our trip. It was there that my epiphany took place at the end of a pair of chopsticks. The older of two workers—dressed in chef’s whites and likely the proprietor, though our language skills kept us from finding out—ladled a small puddle of dark, fragrant broth into each bowl while customers queued up at the side. We scrambled into formation as he dropped tender greens into the bowls, then reached for the seasoning to strew over each. Seamlessly, the second worker took over, arranging pork slices over the noodles. With a hint of dramatic flair, the proprietor sprinkled a final flourish of sliced green onions. The universe had shifted course for me as I leaned against the high-top metal counter, bowl of ramen front and center, the clamor of street activity all about me. Cook’s note: Most ramen shops in Japan use pork bones as the base for their broth, though chicken bones or dried fish can play a role. This simplified version uses only chicken. A dab of any reserved pan juices in each bowl adds complexity to the dish. From “Japanese Farm Food” by Nancy Singleton Hachisu. 1. 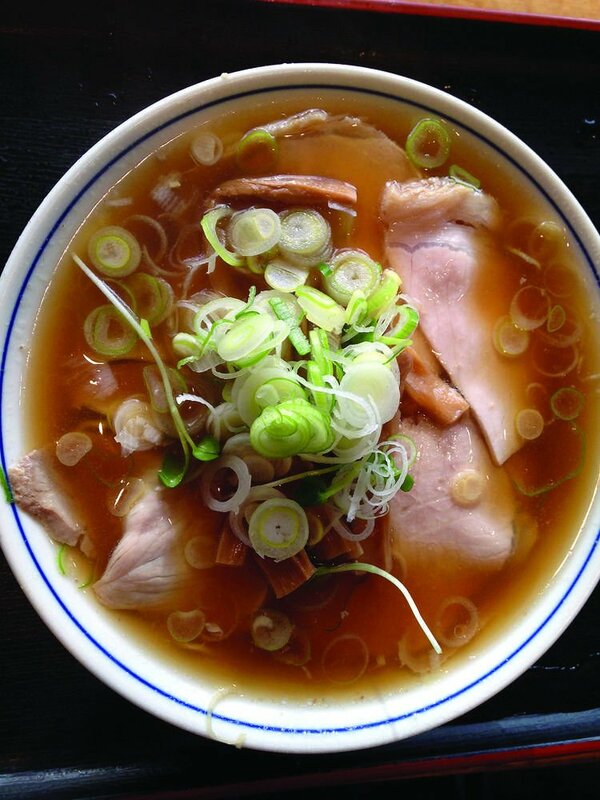 To prepare broth: Start ramen soup early in the day or at least several hours before dinner. 2. Heat oven to 450 degrees. Put carrots, onions, ginger and chicken in a cast-iron pan and sprinkle with salt and oil. Distribute oil around to coat all the chicken and vegetables and roast for 30 to 45 minutes. 3. Scrape roasted chicken and vegetables and all of pan drippings into a large heavy pot with 4 quarts cold water and bring to a boil over high heat. Lower heat and simmer, covered, for 1 hour. 5. To prepare noodle dough: Mix 2 tablespoons sesame oil into flour with your fingers until crumbly. Add eggs and egg yolks and stir with your hands until just incorporated. Knead on clean flat surface for 5 minutes until pliable but stiff. Let dough rest while you prepare ramen toppings. 6. To make half-boiled eggs: Carefully place eggs into boiling water and boil for 7 to 8 minutes. Plunge eggs into cold water and run more cold water over them until water temperature remains cool. Remove eggs from water when completely cool and remove shells. Slice eggs in half with very sharp knife. 7. To finish noodles: Fill largest stockpot you own with hot water and bring to boil over high heat. On a floured surface, roll out ramen noodle dough into a rough oblong shape to slightly less than 1/8-inch thick. With a sharp knife or pizza cutter, slice 1/8-inch wide strips to create noodles. Then cut noodles into 9-inch lengths, flour well, and toss to distribute flour. Leave on workspace, but do not clump into a mass. 8. Take out 1 large soup bowl per person and add seasoning to each bowl: 1 tablespoon miso, 2 teaspoons soy sauce or 1/2 teaspoon salt. Mix a little broth in to melt the salt or emulsify miso. Distribute reserved shredded chicken pieces among bowls along with a small amount of broth in which it was cooled. 9. Boil noodles for 2 minutes. Just before noodles are done, add 2 or 3 ladlefuls of broth to bowls. Scoop noodles out of boiling water and drop into a large strainer. Divide noodles among bowls filled with soup and quickly add 2 egg halves, a dollop of greens and 2 pieces of nori before sprinkling with green onions. Serve immediately.